Symptoms of whiplash are quite individual as every accident is unique. A great multitude of symptoms and signs may occur after whiplash owing to the fact that every accident is unique and there is no typical patient. The common motor vehicle crash can damage the body, literally from the toes to the skull, and everything in between. It also can and does kill a great many people. Perhaps, more important is those it leaves disabled and spastic, or facing a lifetime of pain. If you learn nothing else from this page, may I humbly suggest that you drive more slowly, obey the laws of the road even when they are irritating, like a stoplight on orange, and never to drive when you have alcohol or drugs in your system. Always wear a safety belt; the very worst accidents occur when you are thrown out of the car. Whiplash almost always leaves its mark; a life long legacy of pain. There are no perfect solutions but we think whiplash chiropractic is one of the better once; perhaps the best! The human skull weighs typically just a little less than five kilograms. Set upon very small and fairly fragile tower of cervical bones, and supported by soft tissue structures designed to make the head highly mobile (ligaments, muscles, discs ...) the skull, when abruptly set in motion, places very great forces on the neck and upper back. shock to the neurological system is simply enormous. Dizziness, memory loss, fatigue, inability to concentrate are many other odd seemingly unrelated symptoms are quite usual. Until recently, it was mystery how people emerged from an accident with almost no symptoms of whiplash, or signs yet, within 10 years, their neck was an arthritic mess. Now it is well understood. Research shows that joint nutrition is dependent on movement of nutrient- and oxygen-rich fluid within the joint. Once joints stop moving, the cartilage begins to degenerate (in mice at any rate) within 12 hours. After thirty years in practice I am convinced of one thing: there are very few whiplash injuries that leave people completely untouched. Research that follows the victims of whiplash for ten years after an accident, reveals that only 12 percent have absolutely no symptoms. Psychological sequelae are ever present, and to make it more complex, research indicates that the presence of litigation often appears to delay healing. Read more about whiplash research. Post Traumatic Stress Disorder, perhaps in just small measure, is universal. After all almost every whiplash one realises one has had a brush with death. Fear when others are driving, nightmares and depression are not uncommon after whiplash. Secondly, from concussion. 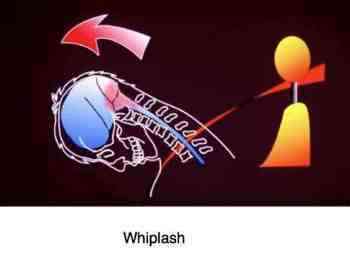 In whiplash, the brain rockets from one side of the skull to the other, bashing itself at least twice against hard bone. Seatbelts certainly reduce more serious skull fractures but instead concussion occurs, if only in small measure, with every MVA. So dizziness, blurred vision, memory loss, hearing loss, and ringing in the ears are not uncommon. Arm and shoulder pain, and much much more. Chest pain from the seat belt. There is a school of thought promulgated by a prominent orthopedist in the Netherlands that whiplash is no different to a sprained ankle. This lady's views, portrayed in a prominent and I believe highly irresponsible newspaper article caused great anxiety and confusion to many victims of whiplash. Her opinion seems to be that either whiplash kills you, or causes little more than sprain of ligaments and strain of muscles. There is no continuum. Oddly she even denies that a collar may be of value in whiplash, but is happy to recommend a cast or supporting bandage for a sprained ankle. Seemingly, having forgotten that the skull and cervical spine contain the most sensitive structures in the body, the central nervous system, this report has reputedly plunged many victims of whiplash into despair. Fortunately, at Chiropractic Help, we have many tools at hand. We can immobilise with a collar, stretch, massage, cross friction, adjust the spine using both forcible and gentle techniques, use ice for the swelling, and counsel. What is problematic for doctors who see whiplash in only one mindset, having only one implement in their toolbox, is that that instrument may indeed become a hammer. This is just as true of a medical man who has only drugs at hand, as the chiropractor who only adjusts the spine forcibly. Their treatment may not be the treatment of choice for an acute neck injury, and may aggravate the symptoms of whiplash. Neck pain treatment is entirely dependent on the diagnosis; chiropractic adjustments may be entirely inappropriate or the therapy of choice. Every doctor can and should use his own discretion, but for myself I would choose to rule out fracture and serious ligamentous injury that occurs more often than not. 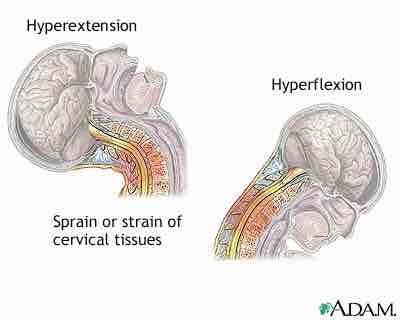 Three times in my career I have had patients who presented with upper cervical pain several weeks after an MVA. 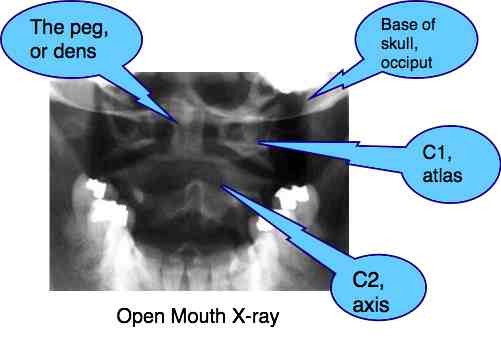 They had been X-rayed in hospitals where the "open mouth" view for the upper cervical spine is only rarely taken. All three had an Atlas fracture. It was only a careful clinical exam that revealed the likelihood of a fracture, saving my bacon and their lives. Manipulation would have been disastrous. Whiplash of course doesn't not only occur after MVAs. A fall from a horse, a trampoline, diving into shallow water, thundering down a staircase ... fractures of a lesser nature are not uncommon. Few escape without some form of injury that may leave lasting symptoms of whiplash. So, what are these symptoms of whiplash? They are divergent and complex. There are no two that are exactly the same. The position of your head in the accident, the angle at which you were struck, or struck another impediment (and then another? ), whether you anticipated the accident and tensed your muscles. All of these variables make each whiplash unique. It can affect your low back, your ribcage, and whilst the seatbelt may haved saved your life it probably contused the breastbone and ribs. The airbags themselves can cause injury. You are not going crazy! But recognise this: if you are hoping for a big monetary claim, research clearly shows that it's likely to delay healing, perhaps seriously so. Get on with life, accept that what has happened, is history; it's set in concrete and bemoaning the fact will do you not one iota of good. If you get compensation, well and good. If not, put the accident firmly behind you, and move on. Do not, for heavens sake, allow that drunk to continue trampling your mind, long after the accident. "Even a wise man can make a new mistake every day." Move on, just don't make the same one again! That's not wise. Even if your foolishness led to the death of another innocent person, move on, make up for it in whatever way you can. Allowing guilt to paralyse the rest of our lives has no benefit to anyone. Chiropractic help is always precluded by a thorough examination. So, in conclusion, a great multitude of symptoms of whiplash may occur. Every accident is unique and there is no typical patient. The common motor vehicle crash can damage the body, literally from the toes to the skull, and everything inbetween, and so the symptoms may be very varied. If there is concussion, which is likely, then you may have dizziness, memory loss, even deafness. You can have fractured bones in the spine and ribs, breastbone pain is common ... the list is endless. For more information about chiropractic help neck treatment after whiplash click here, NECK PAIN TREATMENT. Vertigo may also be caused by a whiplash injury as the tiny crystals on the ends of the hairs in the inner ear are shaken loose; the treatment of choice is not pills or manipulation but the Epley manoeuvres. Tingling and numbness in arms & fingers but not in thumbs - Carol.